Armenian Aryan Order is announcing that the U.S. office of the Armenian Aryan Order (AAO), which is called the Armenian Aryan Fist (AAF) has a history of 10 years, and is regulated solely by the orders of Armen Avetisyan, the leader of the AAO and the Supreme Council of the AAO. After an attempt on the AAO leader’s life, in November 2009, when comprehensive inspections were carried out in the Diaspora offices of the AAO, Armen Shahbazyan, who was in charge of the U.S. office of the AAO, was dismissed from the organization, and replaced by Vardan Zohrabyan, one of the dedicated members of the American-Armenian office of the AAO. The former leader, Armen Shahbazyan, had been dismissed on the grounds of embezzlement committed in the course of many years, as well as his failure to notify the AAF members about the activities of the AAO and its orders in their entirety. For many years, Aryan American-Armenians have been organizing fund-raisers to support the activities of the AAO. However, the abovementioned person, formerly in charge, had been appropriating a part of that money, taking advantage of our trust in him. However, recently he has been appearing on some American-Armenian TV shows in Los Angeles, using the symbols of the AAO-AAF, which is impermissible and is a deliberate provocation against the AAO. Recently he has presented himself as “the head of the U.S. office of the AAO” (http://www.youtube.com/watch?v=8tEseX-jrUE&feature=player_embedded), which is a fraud and an outright lie. The Supreme Council of the AAO is informing the Diaspora Armenians, especially the American-Armenians, that Vardan Zohrabyan is the one in charge of the Armenian Aryan Fist, the U.S. office of the AAO, and that Armen Shahbazyan cannot represent any AAO office. And if any agreements have been signed with him until now, the AAO is making an official announcement that it carries no responsibility. The Supreme Council of the AAO is addressing the Armenian authorities with request to have the Armenian Embassy in the U.S. (or the Consulate General) call him to account and teach a lesson [? կարգի հրավիրել] to Armen Shahbazyan and his followers based in Los Angeles, since the political wing of the AAO, the Armenian-Aryan Party of Armenia, is an organization registered at Armenia’s Justice Ministry and operates under the laws of the Republic of Armenia. A corresponding letter will also be handed to Eduard Nalbandyan, Foreign Minister of Armenia. 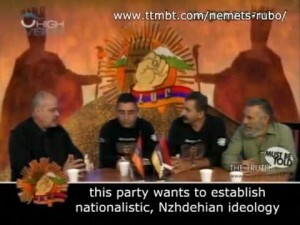 The Supreme Council of the AAO is also addressing the U.S. authorities to call U.S. citizen Armen Shahbazyan, resident of Los Angeles, to account for deliberate exploitation of the name of our organization operating under the laws of the Republic of Armenia, which, I am certain, is also a violation of the U.S. laws, since a U.S. citizen is violating our copyright and damaging the reputation of our organization. A corresponding letter will be handed to the U.S. Embassy in Armenia.